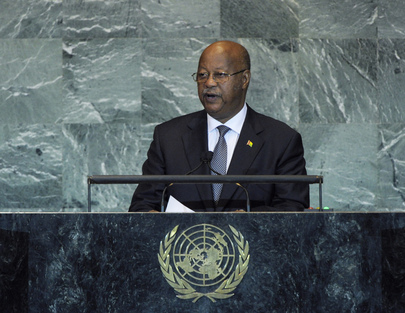 CARLOS GOMES JÚNIOR, Prime Minister of Guinea-Bissau, said defence and security sector reform was an urgent priority for his country. For its part, his country’s commitment to mobilizing resources for the sustainability of that reform had led to the creation of a special pension fund and had deposited $200,000 of the $500,000 the country pledged to the fund, as proof of its commitment to contribute 10 per cent of the total resources required. He counted on holding a high-level meeting with development partners to obtain the financial and technical assistance needed to complete the reform process. As resources were also needed to tackle drug trafficking and organized crime to bolster existing Government plans, he formally requested support from the United States, the European Union and its Member States. Meeting the approaching Millennium Development Goals’ deadline was another challenge, he said, and a high rate of poverty still prevailed in Guinea-Bissau. The National Poverty Reduction Strategy Document defined those challenges and recommended priorities for the next five years. Following that strategy had already reversed that negative trend. The current economic situation was improving over the last two and a half years, as a result of public policies and good macroeconomic performance, including the forgiveness of about 90 per cent of external debt and a gross domestic product (GDP) growth rate of 5.3 per cent. To continue forward, his country would hold a donor round table in 2012. He welcomed the creation of UN Women, noting that his country had already taken measures to uphold the dignity of women, including promoting empowerment, criminalizing female genital mutilation and increasing penalties for the trafficking of minors, he said. He then welcomed the Palestinian Authority’s decision to request recognition of the State of Palestine as a full member of the United Nations. Regarding the major changes in the Arab world, he regretted the cases where transition incurred high costs in terms of human lives. On the subject of Libya, Guinea-Bissau supported the African Union’s position and expressed full readiness to cooperate and strengthen the increasingly friendly relations and cooperation with the legitimate representatives of the Libyan people. He also urged the United States to resume its relationship with Cuba. The responsibilities of the United Nations were increasing and the historical reasons that led to the establishment of the Security Council were no longer current. Demographic representation was needed as part of the Council’s reform. Under the auspices of Guinea-Bissau’s President Malam Bacai Sanhá, the National Assembly had launched a process of national reconciliation involving all the forces of the nation. That important initiative had contributed to the establishment of peace and understanding that now prevailed in the country. “We will spare no efforts in consolidating peace and building a more just society to create better living conditions for the Guinean people,” he concluded.